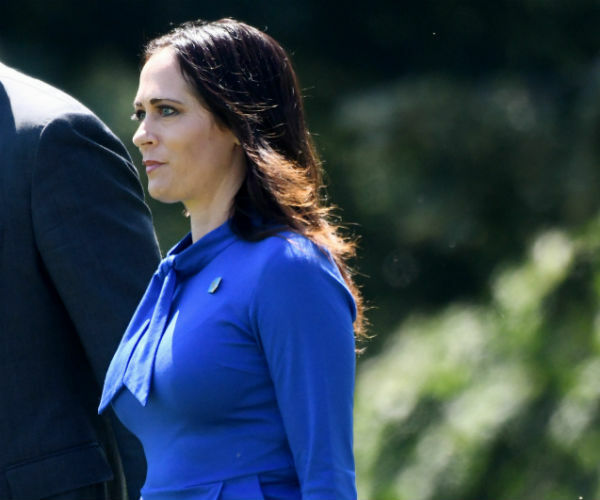 Melania Trump’s spokeswoman Stephanie Grisham violated the Hatch Act. The Office of Special Counsel (OSC) warned Melania Trump’s spokeswoman over a tweet found to be in violation of the Hatch Act, according to a letter sent to a Democratic senator. Sen. Tom Carper (D-Del.) on Thursday tweeted images of a letter he received from the OSC in which the agency responds to an allegation from his office that Stephanie Grisham, the first lady’s longtime spokeswoman, violated the Hatch Act with a tweet containing the acronym for President Trump’s campaign slogan. Grisham, as a White House staffer, is prohibited from using her government position, including the Twitter account she operates in her capacity as spokeswoman, to advocate for political candidates. The president, OSC said, falls under than umbrella. He also ripped the administration’s “repeated” violations of the law. “Two months after my inquiry, the @US_OSC has confirmed that yet another Trump White House staffer has violated the Hatch Act. This administration’s blatant and repeated disregard for the law is astounding and unacceptable,” Carper tweeted. “At the very least, we should be able to trust that those who serve in the highest positions in our government will follow the law. Instead, this administration seems to promote a culture where showing that basic level of respect for the American taxpayer is optional,” he added. A number of Trump administration officials, including White House counselor Kellyanne Conway and U.S. Ambassador to the United Nations Nikki Haley, have been cited by the OSC in the past for violations of the law, but no punishments have been levied by the White House. Authority to punish Hatch Act violations falls to the president. The OSC does not have the power to take action other than informing the White House of violations.